Learning how to cook whole chicken is important when you are budget cooking. Sometimes you can find parts like the leg and thigh or wings on sale at good prices but they are all dark meat. If you want any white chicken meat at all it is cheaper to buy the whole chicken. A whole chicken can be prepared roasted, boiled, grilled or baked. By learning how to cut a whole chicken into pieces opens unlimited possibilities of cooking. When you learn how to cook whole chicken you will see it is so easy just to place it in a roaster, sprinkle with a little seasoning, put it in the oven and have dinner ready in about one hour. You can also cook the chicken in water on top of the stove and have delicious chicken broth to flavor stuffing, dumplings noodles or other pasta recipes. When learning how to cook whole chicken it is important to know chicken cooking time for properly cooked poultry. When checked with a meat thermometer the internal temperature should read 180F degrees. The tip of the thermometer should be inserted into the thickest part of the thigh and should not touch the bone. If you do not have a meat thermometer, pierce the inner part of the thigh. If the juices run clear and the leg moves easily, the poultry is done. Let roasted chicken stand covered 10 to 15 minutes to allow juices to settle before carving. The internal temperature of stuffing should read 165F degrees before it is safe to eat. Remove the giblets from cavity; pull the fat out from the neck and tail. Place the chicken on the back. Pull one leg and thigh out from the body. With a sharp knife slanted toward the body, cut down through the skin between back of thigh and body to reach hip joint. Bend thigh backwards until hip joint pops out. Cut through hip joint to fee the thigh. Remove other leg the same way. With a finger feel where the drumstick and thigh are joined; cut through joint to separate. Repeat with other leg. Prop chicken on its shoulder with the tail up, support back with one hand while cutting between the front and back ribs. Bend backbone away from collarbone and cut through exposed joint to sever connection between breast and back. Bend back in half where rib cage ends and cut through this point to divide back into two pieces. Place breast skin side down on cutting board. With a sharp knife, make a slit down the center of white cartilage continuing through the thin membrane that covers the breastbone. Bend tip of breast backwards where cartilage meets breastbone until breastbone pops out. Pull out the breastbone freeing the meat from each side. Fold breast in half lengthwise, pushing down hard to break the wishbone. Cut breast in half lengthwise. When the cutting is finished I take the neck, giblets, back parts and boil them to prepare a flavored broth for cooking cheap recipes like noodles or dumplings. I usually bread and fry the parts. 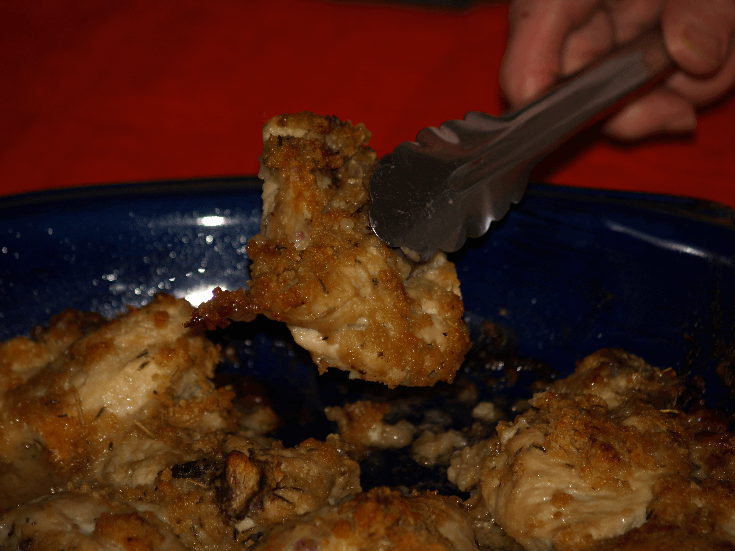 Sometimes I will remove the bones from the breast, pound them out and make dishes like chicken cordon blue. Knowing how to cut a chicken is important if you learn how to cook whole chicken. Cover whole chicken with water and bring to a boil; season with salt and pepper, simmer until meat is very tender. Remove chicken from broth and arrange pieces on platter for serving; set aside and keep warm. Combine and blend flour, baking powder, salt and shortening; stir in milk to make a drop batter. Drop by spoonfuls into boiling broth; cover and cook 10 minutes or until dumplings are done. 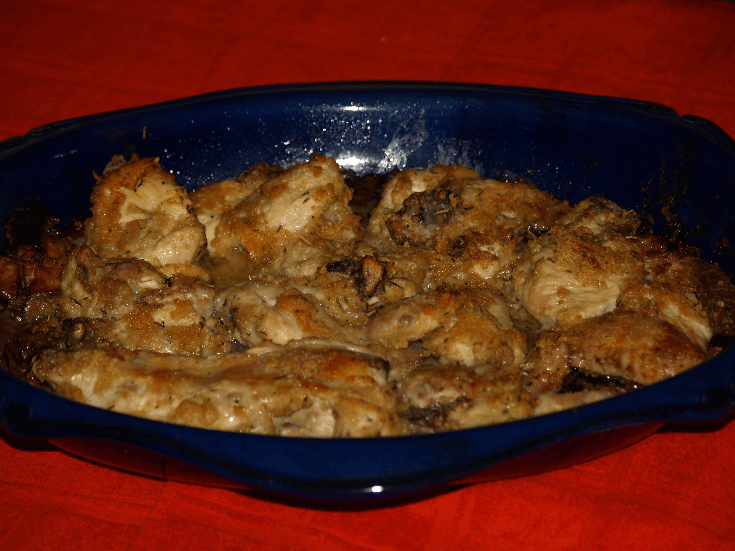 OVEN FRIED CHICKEN RECIPE This is a traditional way when you know how to cook whole chicken. Combine garlic, salt, parsley, cheese and crumbs. 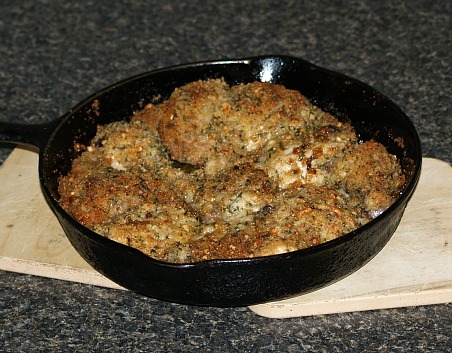 Roll chicken in melted butter, dip in crumb mixture. Place on foil lined baking sheet; bake for 1 hour at 375F degrees. Combine cereal, flour and seasonings in shallow dish. Dip chicken pieces in melted butter; roll into dry cereal mixture. Place on shallow baking sheet; bake 30 minutes; turn pieces over and bake 25 minutes longer or done.